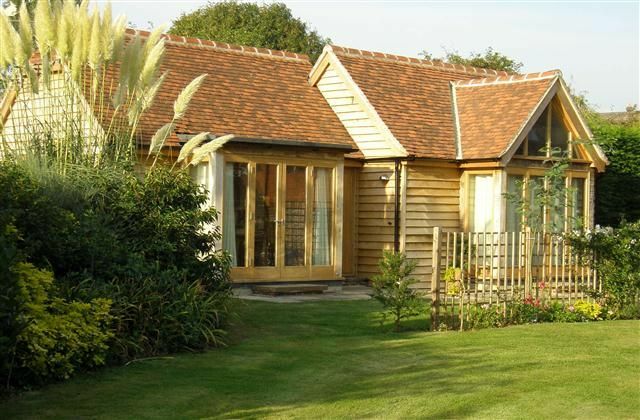 Goodwood Oak Lodge is a spacious, light and stylish self catering holiday property. It is located on the edge of the Goodwood Country Estate just 2 miles east of Chichester and offers country views onto gardens and open fields across to Chichester Cathedral. Close to lovely country pubs and an ideal base for walkers. Well behaved dogs are considered. The property is perfect for those wanting comfortable accommodation with a contemporary twist. There is a well equipped kitchen with everything you may need and a king sized bedroom with en suite shower room. The lounge dining area has a 2 seater sofa and snuggles, TV and DVD player for relaxing. Oak dining table and chairs for meals looking onto south facing garden. Guests can take an easy stroll from the Lodge to Goodwood House, Goodwood Country & Golf Club or drive to the South Downs for walking in a few minutes. Private entrance and car parking space for 2 cars. Well behaved children and pets at owners discretion. A welcome basket is provided. All linen, towels and guest toiletries are included. Wherever possible the owner will meet guests but if not a key code is given prior to arrival. I have successfully run 2 holiday properties in West Sussex for 8 years. I love my work and enjoy seeing visitors return year after year. I always offer a personal touch - meeting and greeting guests, always being on the end of a phone. Oak lodge was built in the grounds of Oak House, mainly to provide much needed accommodation for Goodwood events. In the first year I got my first lot of guests to each event and most have been coming every year since. Good friendships have been made. The Lodge is available throughout the year and is a great location for week end or mid week breaks or as a very well equipped self contained home has provided a longer term home for people waiting to move or securing temporary work in the area. Everyone comments what a great location it is - 2 miles out ogf beautiful Chichester but on the edge of South Downs National Park and only 10 mins from the coast. An illuminated bathroom mirror that never steams up! Walk in shower. Heated towel rail. Walk in shower. South/west facing garden area with bistro table and chairs. Goodwood Hotel , Golf & Leisure Club is a few minutes stroll from the property down a one-way country lane. (Restaurants open to non-members or non- hotel guests & we can offer guest entrance to use the swimming pool, tennis courts, gym & spa facilities). A week membership through owner. arranged at only £20/week. The Kennels (for more golf, racing, or flying members is less than 3 minutes drive away). Limited wheelchair access. Several guests have stayed who have been in wheelchairs. We had a very comfortable and happy stay. The owners were hospitable and were helpful in every way. Absolutely spot on. The lodge is beautiful, with lovely fixtures and fittings throughout. Your own parking space and area of garden (that can be secured if - as I was - you are visiting with dogs) and a separate seated terrace area with lovely views over the fields. The owners could not have been more helpful or friendly. An easy 10 minute 3 mile drive into central Chichester. An absolute winner - we will be back! A comfortable modern holiday home with views across open farmland. We had an enjoyable week in this Lodge with every convenience in a quiet but accessible location, tucked away with seating outside and off road parking. Lovely cottage. Great area to stay in, so many things to do in this location. The lady that runs the property was wonderful! Incredibly helpful and thoughtful. A plethora of special interest activities include Goodwood Road Racing, Flying and Horse racing clubs. West dean has a huge variety of wonderful gardening and art courses as does Singleton open air museum. Nearest beach 7km. Chichester harbour is a beautiful estuary and abounds in water and walking activities. East Head and West Wittering attract the rich and famous as well as local families looking for the perfect place to walk, swim and sunbathe in the sandy dunes. Southampton airport is a 50 minutes drive away and Gatwick International 80 minutes drive away. Airport - Southampton or Gatwick approx 50km. Boxgrove village and stores is a mile away. Famous for the beautiful 12th Century Boxgrove Priory. On the edge of the South Downs National Park there are beautiful walks from the Lodge, including walks around Goodwood Country estate. Chichester with its famous Cathedral, lovely shops and restaurants is less than 10 minutes drive away. The cathedral spire can be sen from the Lodge. The nearest supermarket is Sainsburys, less than 5 minutes drive away. There is a lovely John Lewis at Home department store 5 minutes away and Waitrose about 8 minutes drive away.